Smoke grenades are a staple of any wargammer's gear, from the casual airsofter to the hardened MilSim veteran the ability to lay covering smoke on a battlefield can add a tactical advantage.With TLSFx's Cool Burn technology our smoke grenades and smoke bombs lends themselves to all combat environments. Our high out put pyro smoke canisters are perfect at covering areas in thick smoke as fast as possible. TLSFx's smoke grenades are the best smoke bombs available today. 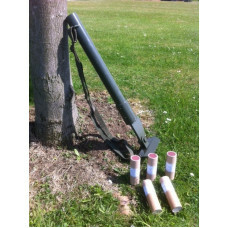 Our budget smoke grenade still packs a punch with a 120 second burn time, dispensing a thick blanket..
Our updated paratrooper / commando mortar is of welded stainless steel construction, and is specific.. The new Dual Vent Smoke Screening Grenade has been designed to create a thick blanket of smoke as qu.. The M14 is the latest in a long line of smoke screen deployment grenade designed and developed by TL..